Egypt’s revolution: Is it too late for democracy? It was always going to be hard. Now the window for democracy is closing fast. 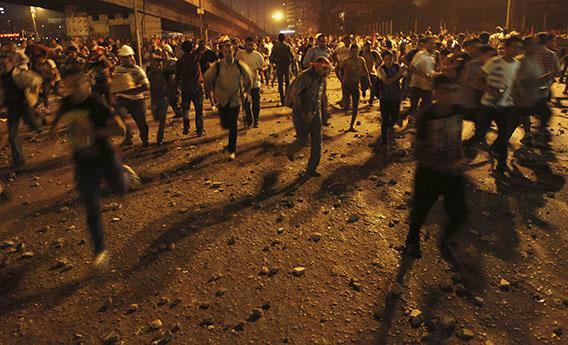 Anti-Morsi protesters run during clashes with members of the Muslim Brotherhood near Tahrir square in Cairo last week. What does it look like when your revolution is failing? Look at Egypt today. Six days ago, the Egyptian military forcibly removed an uncompromising, incompetent, but democratically elected president from office. Former President Mohammed Morsi now sits in house arrest. The generals, in contravention of the country’s new constitution, then installed a rump government to paper over their undemocratic gambit. The escalation of rallies and counterrallies between Morsi’s critics and his Muslim Brotherhood backers led to a seemingly inevitable loss of life on Monday when 51 people died in a clash that each side blames on the other. Now the Muslim Brotherhood is calling for a national uprising against the country’s generals, and all the while Egypt’s economy and basic governance remain in free fall. It is too soon to call Egypt’s revolution over—and there is no question that the country could fall much further. That’s why it’s so urgent to right the ship before fears of growing sectarian strife, widening violence, or even civil war become more real. The trouble is the window for even the most basic successful democratic transition appears to be closing. Egypt’s paltry political inheritance after 30 years under Hosni Mubarak guaranteed that this would never be easy. When the dust settled from the collapse of his regime, the only institutions that remained standing were the Egyptian military and the Muslim Brotherhood—the backbone of Mubarak’s authoritarian system and the banned political party that had been persecuted by that system for decades. An accommodation between these two players was always going to give Egypt its first, best chance at democracy. That seems like a far more remote possibility today. Even Tahrir Square is complicating matters now. Tahrir is less a creative epicenter of protest than a revolving door for hollering grievances against whoever is in charge. To be sure, Mubarak, the military, and Morsi each deserved that criticism in turn, but at this point everyone has been a target of Tahrir, leaving no one with the standing to lead with a clear mandate. (The only other potential leaders, secularists such as Mohamed ElBaradei, are too politically irrelevant.) In recent days, Egyptian police officers have been lauded and celebrated by protesters in the square. That would have been unimaginable in February 2011 when the country’s corrupt and abusive police officers were among the most reviled. Wait long enough and Tahrir will eventually love you and hate you. Now that the military has torn down what little democratic scaffolding Egypt had, the generals must construct a sufficiently broad coalition in a country that is more polarized than ever. The military, under the name of its self-appointed interim president, has laid out a six-month timetable for getting the country back to elections, but the military has failed to meet such accelerated deadlines before. And there is no reason to think that members of Egypt’s military brass are all of a sudden going to become gifted politicians. Remember, these are the same generals who prosecuted the staff of pro-democracy NGOs like Freedom House on trumped-up charges, sentenced more than 12,000 Egyptian civilians in military courts after Mubarak’s ouster, ran over protesters with tanks, and kept the Egyptian media muzzled. In the wake of the military gunning down Morsi’s supporters in Monday morning’s clash, the Al Nour Party—an ultraconservative Islamic party that has become a critical swing vote in Egypt’s electoral politics—said it was pulling out of discussions with the military over the creation of an interim government. Who can blame them? The military’s tactics makes it hard for anyone to stand close to them for long. The prospects for Egypt’s revolution may have been dim from the beginning, and not just because of the toxic politics. The truth is that many of the earliest decisions—which were made or pushed by the generals who were then in charge—planted the seeds of the revolution’s destruction. Egypt’s military moved quickly to preserve the strong presidential system that had been in place since the Free Officers coup in 1952. (If they are familiar with the end of Eastern European dictatorships in the late 1980s and early 1990s, they know that those who chose a strong parliamentary system are the only ones who have avoided an authoritarian relapse.) Indeed, President Morsi took only a handful of months to demonstrate how easily Egypt’s young democratic system could be abused and turn dictatorial. The generals ensured that the revision of the country’s constitution would include protections for the military that frankly run counter to any truly democratic regime. And as Harvard political scientist Tarek Masoud points out, Egypt’s military-led government was hardly inclusive, dissolving the former regime’s National Democratic Party in April 2011, thereby guaranteeing that many of the remnants of the old regime would have a greater interest in playing the spoiler than helping to get the country back on its feet. And, to be fair, getting revenge against the old regime was a popular position at the time. If you walked through Tahrir Square in March 2011, you would come across posters with the faces of Mubarak-era officials that protesters wanted to see punished. I remember seeing one that had the names of 74 leaders listed from top to bottom. So, in the last week, as Egypt’s revolution has appeared to go off the rails, we may simply be witnessing the inevitable outcome of what Egypt already set in motion. Then again, the military seems intent on finishing the job.